Local newspapers often tell stories that fall outside the national media\'s attention. As a severe drought grips large parts of India, Catch curates important, interesting and ignored stories from the hinterland. A hockey match in Odisha's Rourkela got cance;led because of scarce water in the area, reports Odia daily Sambad. It quotes officials as saying that the hockey field at the Biju Patnaik Hockey Stadium is an astroturf, an artificial grass used for sports fields, that requires plenty of water everyday for it to be maintained before a match. The astroturf has not been maintained for more than a week due to scarce water in the surrounding area. Officials say groundwater levels have severely depleted in the area. The stadium is the biggest in the state and hosts a variety of sporting events. It's not new for a match to be cancelled here due to water scarcity in the area. Mahendra Singh Dhoni has drawn the ire of people in Jharkhand's capital city Ranchi because of a pool he built in his ancestral home in Ranchi's Haramu area. Several locals raised objections to this in a public meeting held by state revenue minister Amar Kumar Bauri, reports Bhaskar. 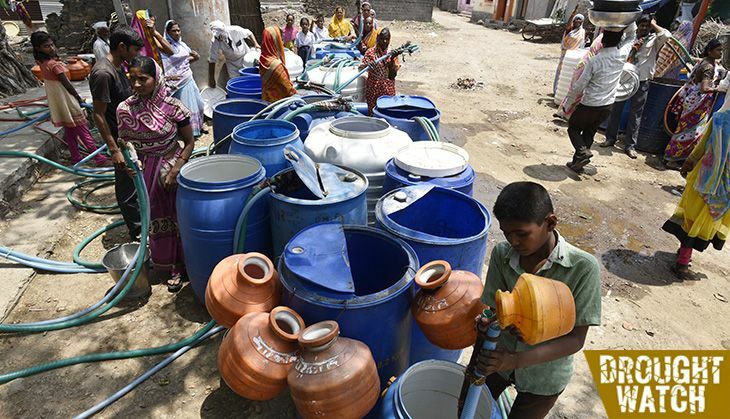 Jharkhand has declared a drought in 22 out of its 24 districts, and the capital too is suffering from water scarcity. Locals allege that while water scarcity in the area is as bad as in Latur, Dhoni's pool uses 15,000 litres of water daily. They complained that all this water goes for a waste especially because Dhoni hardly spends any time there. Naldurg is a town in Marathwada's Osmanabad district. While the Naldurg Fort is an architectural marvel known for its water conservation, the town hasn't been so lucky. A report in Marathi daily Lokmat describes the poor state of affairs. In 1995, a water filtration plant was set up after spending "crores of rupees", but this is not functioning as the filters haven't been replaced. A water tank has not been cleaned in years - as a result, there is a large amount of bird excreta and rotten fish and frogs in the tank. The municipal council had acquired potash, as an easy way for people to clean their water supply. But there is no expiry date on the stock, so nobody is sure if they should use it. Meanwhile, there seems to be a small scam - while the municipality's register says it has a stock of 290 kg of alum and 700 kg bleach, the actual stocks are 25 kg and 50 kg, respectively. Illegal water filtration plants have mushroomed in Gujarat's drought-prone Kutchh region, reports Gujarati daily Divya Bhaskar. Bhuj, Kutchh's largest city, has as many as 31 such illegal plants. The state is yet to officially declare drought. There are 81 such illegal plants in Kutchh, according to a complaint filed with the state government by the package drinking water manufacturers association. They allege that the plants draw lakhs of litres of water from underground and taps, and end up selling only half the water and wasting the rest. The water is then sold in 250 ml pouches as well as 20 litre jars. By drawing water without permission, the plants make a killing by not paying statutory taxes, also causing a direct loss to the exchequer, the report adds.